At the conclusion of her title bout with Frankie Quinn at last month’s Open Fire event, Scarlett found herself laid out in a callous post-match attack. Now, the former champ is out for revenge. Scarlett challenges Frankie Quinn in a two-out-of-three falls match for the KPW Women’s Championship tonight at Maniacs United Roads End. Scarlett became synonymous with the KPW Women’s Championship in the minds of many fans over the course of her year-long title reign as she defended the cup around the country against a number of challengers. She would eventually meet her match against Quinn though, and the title changed hands when the two first met at NZWPW Power Play in November 2014. Scarlett remained in contention for the title, and invoked her rematch clause against Quinn at Open Fire, where she once again came off second best. It was after the match that things went from bad to worse for Scarlett, as Quinn proved to be anything but a good sport and dished out a post-match assault to her already defeated challenger. Scarlett summed up the situation after the bout. With the memory of Open Fire’s events still fresh in her mind, tonight could be Scarlett’s last chance for revenge, and to reclaim the KPW Women’s Championship. Quinn will have somewhat of a home advantage, wrestling in Auckland, but Scarlett has proven herself to be successful around Australia and New Zealand. All other factors aside, the two-out-of-three falls stipulation ensures whoever walks away from Roads End as the KPW Women’s Champion will have definitively earned the title, with two victories over their opponent. 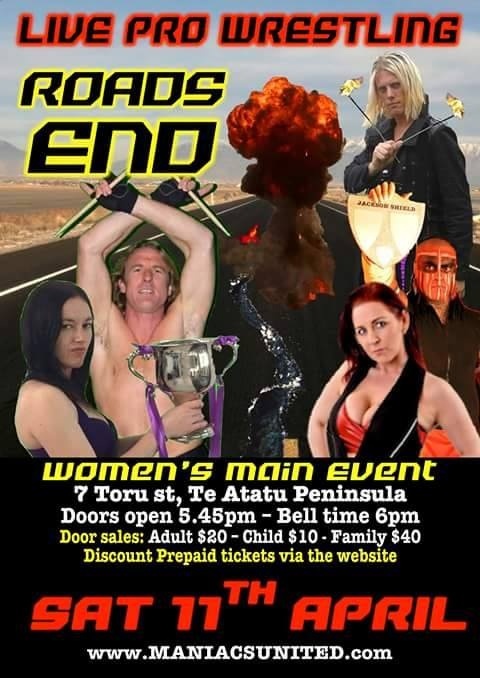 Maniacs United Roads End takes places tonight, April 11, at Rutherford Primary School in Auckland. The card, subject to change, is listed below.